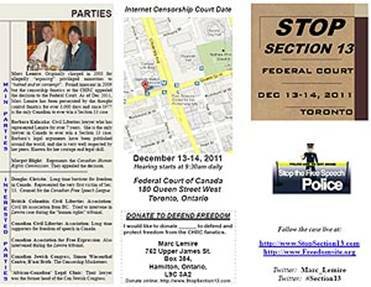 If you are planning to attend the December Federal Court hearing, which will decide the fate of Section 13: Canada's shameful internet censorship legislation, please download a copy of the flyer, which explains the case, the parties involved and the location of the hearing. 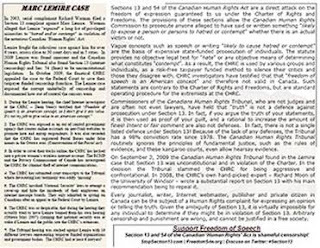 This is a brief summary of what the Marc Lemire case is about, what's wrong with Section 13 censorship and how to follow the hearing on the internet. You can print a copy of the double-sided flyer on any printer and pass them around to your friends or bring a copy to the hearing.